Exit at #96, Portersville. Turn left onto 488W. At the stop sign, turn right, then make the first left (this keeps you on 488W). Follow this road for 8 miles until you cross a concrete bridge. The monastery is 1/4 mile past this bridge on the right. 6:30 AM Matins and 12 PM Hours (every day). Divine Liturgy is served 3 days a week, visit our website or call for specific schedule. 5:00 PM Vespers and Compline. A little about monastic life. Since the beginning of Christianity, the tradition of men and women consecrating their lives to God and living in community has existed. The ancient term for this community is “monastery,” taken from the Greek word “monos” meaning “alone,” as the “monastic” leaves the everyday world to seek a deeper relationship with Christ. For the nun, life is centered around prayer—both formal and shared in Church, as well as personal in her room. She embraces the opportunity to pray for the needs of all people, whether she knows them or not. The monastery receives requests for prayer from many directions: letters, phone calls and from visitors. The second important life in a monastery is the offering of hospitality. Orthodox monasteries are not “cloistered.” We welcome visitors and look forward to the opportunity to have them learn about our leife and experience the beauty and peace of the monastery. For many, the visit is an opportunity to “take their soul on a vacation”—a special interlude in their otherwise busy lives. 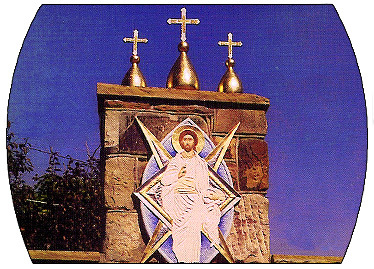 The Orthodox Monastery of the Transfiguration is a monastery for women under the jurisdiction of the Orthodox Church in America. It was founded in 1967 by Mother Alexandra (the former Princess Ileana of Romania) whose dream it was to provide a place where American Orthodox women from all ethnic backgrounds could come to live the monastic life and benefit from a liturgical cycle in English. Since that time, her vision has been fulfilled. The nuns, the majority of whom are converts to Orthodoxy, as well as the monastery’s many visitors, span a variety of backgrounds. We welcome a great number of non-Orthodox visitors as well. Mother Alexandra was the first Abbess, followed by Mother Benedicta who arrived in 1978 from Varatec Monastery in Romania. Under Mother Benedicta’s leadership, a complete cycle of liturgical prayer was established and the strong monastic tradition she had lived in her homeland took root as well. Mother Christophora, the current Abbess, was elected in 1987, and since then the monastery has continued to develop, both spiritually and physically. At the present time there are ten sisters in the monastic community. Our monastery is situated on 100 acres of meadow and lovely wooded land, and its several buildings are graced with flower gardens. The main building includes: —A beautiful chapel, where visitors are welcome to join the nuns for morning and evening services. It is also available for quiet personal prayer. —A large dining room, —a large hospitality room where visitors can relax and enjoy fellowship, —a comfortable library housing an extensive collection of books, videos, and magazines which guests are welcome to use during their stay,—a small gift shop with books, Icons, etc, and—the private living quarters for the nuns. In addition to the main building there are guesthouses, a playhouse for child recreation, a pavilion for outdoor worship, a large gazebo for outdoor dining, and a cemetery for clergy and monastics. Tabor House, our main guest house, has 5 bedrooms with private baths, a kitchen and a spacious dining area-living room. St. Bridget’s guest house has 3 bedrooms with two shared bathrooms, a kitchen and a dining area-living room. Both guesthouses are air conditioned and comfortably furnished. It is necessary to call or write in advance to arrange a stay. In keeping with Orthodox monastic tradition, we provide our guesthouse accomodations free of charge. Most guests choose to leave a donation according to their means. Guests make their own breakfast from food provided in the guesthouse kitchen. They join the sisters in the refectory for a buffet lunch. Supper food is provided and eaten in the guesthouse. In addition, each house is supplied with snack food. We invite day visitors to stop by, although a phone call is appreciated. Mini retreats and lectures are offered throughout the year. Contact the monastery for upcoming special retreats.